Venice, apparently, is the photographer’s dream. And indeed, I would imagine that upwards of hundreds of thousands of shots of Her Sereness are captured every day. And yet, it is quite remarkable that searches on the web for interesting books of Venetian photography give pretty barren results. Obviously there are endless shots of the Canale Grande from the Rialto bridge, of St Mark’s square (or rather the square that people think is St Mark’s but isn’t), of gondolas, etc, but actual, creative, thought inspiring stuff ? Not so much. There are some examples I know of, but they’re quite left of centre. The late Simon Marsden’s “City of Haunting Dreams” is gorgeous, but obviously rather gothic (Marsden is the undisputed master of infrared and “supernatural” photography). And there’s Spanish photographer Toni Catany’s “Venise”, very much a book of two halves, and which seems rather hard to get hold of these days. Leafing through both of these, Catany’s work seems to have influenced me more, at least his later stuff. I have just ordered Christopher Thomas’ Venice in Solitude, which looks good, but again is a little specialised (he uses a now extinct large format Polaroid film). So where’s the classic ? 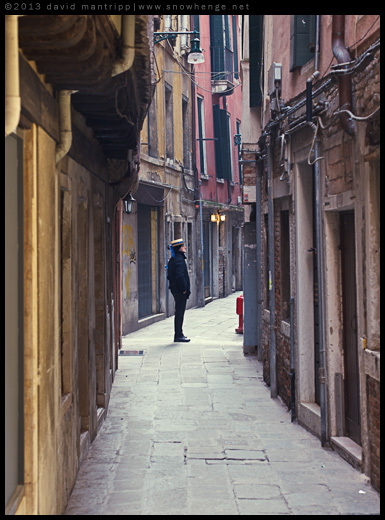 Where’s the “Lost in Venice” that should be in every bookshop, every Venice corner tourist trap? Apparently it doesn’t exist. Maybe with everybody busy taking their own photos, there’s no market for it ? Maybe it is just impossible to grab and fix that elusive essence of Venice, which keeps flashing in the corner of your eye, but vanishes as you try to fix it on film or screen. Maybe some well-known (but not to me) Italian photographer has cornered the market ? Actually, I don’t think so, I did that search too. There are a couple of local photographers I discovered selling prints ands stuff, but I’m not going to link to them, because frankly they’re no better than the average visitor. And there are people doing photo tours - should be a sitting target, but again they seem sadly uninspiring. 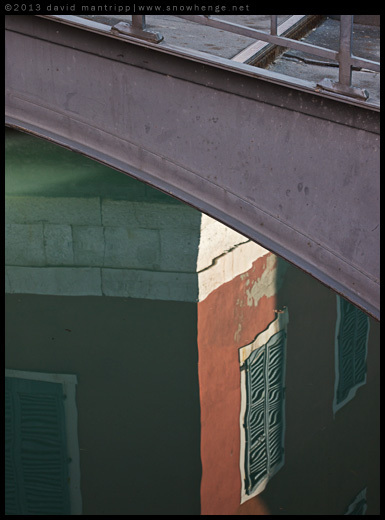 In the current edition of Reponses Photo, you can find three “alternative” views of Venice, by three winners of Fuji cameras taken to Venice by the slightly ridiculous and rather pretentious Jean-Christophe Bechet. The results are disappointing to put it mildly (although Bechet naturally thinks they’re great). One shot modern docks in the fog - ok, fine, Venice has a modern side. Hold the front page. One shot the inside of (modern) museums - well frankly I would have thought he’d have found more, and better, material in Paris. And one was a little more courageous and shot Venice at night. At least he tried. Why did it not occur to Bechet that the real challenge lies not in avoiding replicating the millions of tourist shots, but perhaps to do them well, with an eye to really nailing what it is that captivates people about the floating city. But no, that wouldn’t be arty enough. Except that it would. Venice could, and should, be the muse for some photographer’s masterpiece. But strangely it doesn’t seem to have happened yet. Maybe I’m just ignorant I’ll carry on searching. Suggestions, anybody ? Next entry: What, MORE cameras ?